Max Trott, who has been a dentist and partner at the practice for most of his career, looks at a book celebrating the clinic’s 90 years with Scott Glaskin, the founder’s grandson. 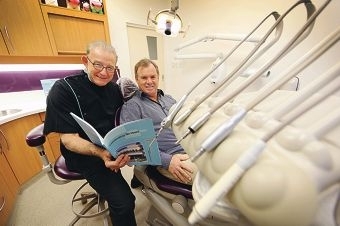 Dentist Max Trott (70) has spent the most of his career at the clinic. Dr Trott said the biggest change in dentistry was the introduction of fluoride in the mid-1960s, which reduced the number of fillings in children and adults and signalled the move into cosmetic dentistry. ‘Over the years dental decay has gradually diminished, certainly in this area,’ Dr Trott said. Dr Trott said the clinic’s client list had grown over time, boosted by the the patronage of boarding school students, in particular those from the country. ‘The past 90 years have seen the business survive by providing the best dental treatment that we can, according to the knowledge and the skills and the techniques available at the time,’ he said. Everyday, more clients are introduced to the clinic by its website.